I tend to gravitate towards neutral shades, especially in the Autumn and Winter seasons. This is because I find them easy to mix and match but look stylish and that's the kind of style I aspire to: effortless chic. In my opinion, a camel coat is an Autumn/Winter staple. 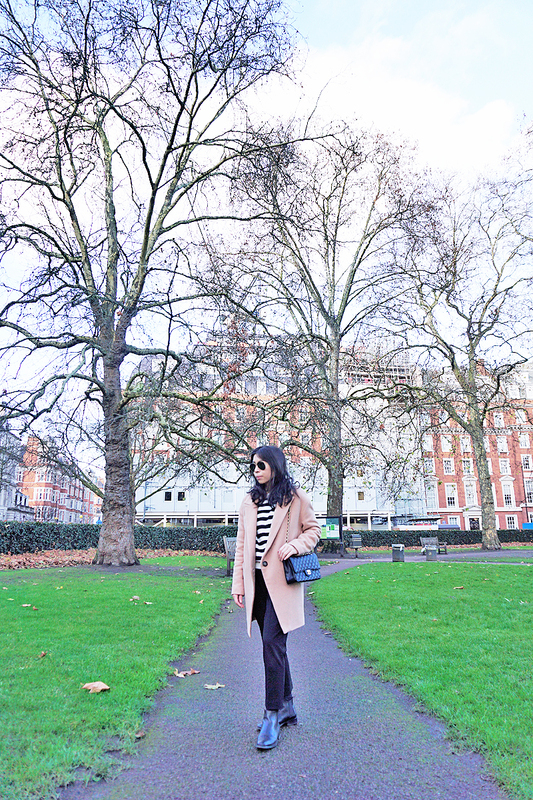 I scored my dream camel coat for 70% off in the Net-a-Porter sale a few years ago. It was love at first sight when I saw its oversized fit and streamlined cut. 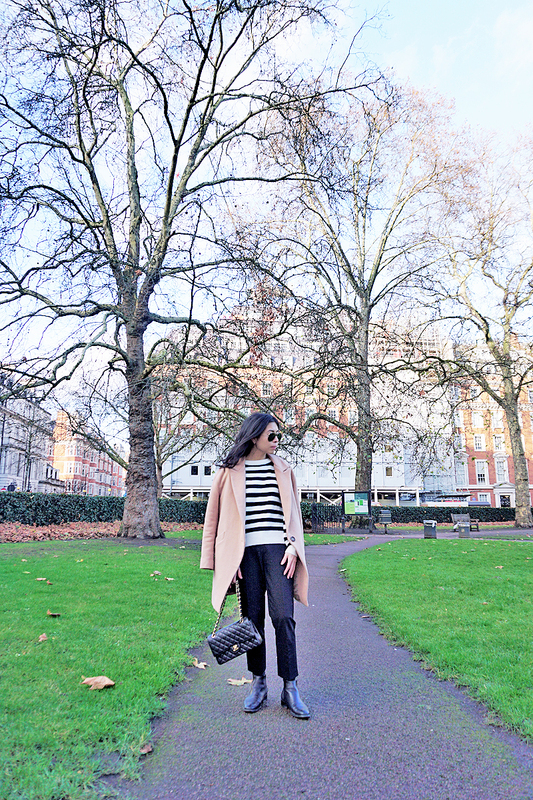 I paired the coat with a black and white striped jumper, and black cigarette trousers. I wear a lot of striped t-shirts in the Summer, so striped jumpers allow me to continue my love affair with stripes in the colder months. Black cigarette trousers are a good alternative to black jeans because their tailored fit instantly smartens up an outfit, which is ideal when you want to look like you put effort into your outfit without actually trying. I struggle to find trousers that fit my short frame, so I get most of my trousers from the petite range or in a cropped style. This allows me to save money on alterations. As for accessories, I opted for classic pieces such as my Ray-Ban 'Aviator' sunglasses, Chanel 'Classic Flap' bag and COS Chelsea boots. I like how the subtle gold accents from the hardware of my sunglasses and bag jazz up an otherwise simple and neutral outfit.